First and foremost, my mom is here, which is always so great, especially for Lexi because she gets to have more family around. With my niece still here as well, she is enjoying all the attention and makes sure that everyone eats together, plays together, goes biking together. We had our first trip to the dentist! 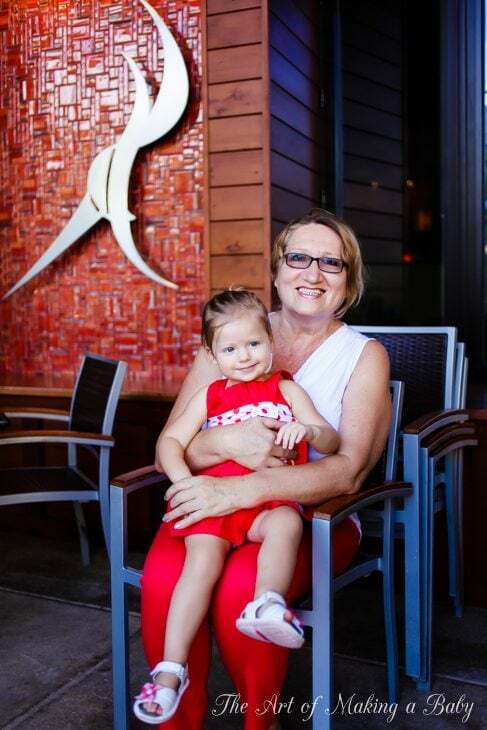 I’ve wanted to take her there since her first tooth, but every time I’d call someone, they would tell me there is no need to do it unless there is a problem. Hm… I knew it to be wrong but i couldn’t find anyone who’d be progressive enough to take her early. On my last cleaning appointment, I asked my own dentist for his opinion and he referred me to a pediatric dentist whose website specifically says that the first visit should be after the baby‘s first tooth breaks. This alone sold me. Andrew and I were both sort of dreading it. 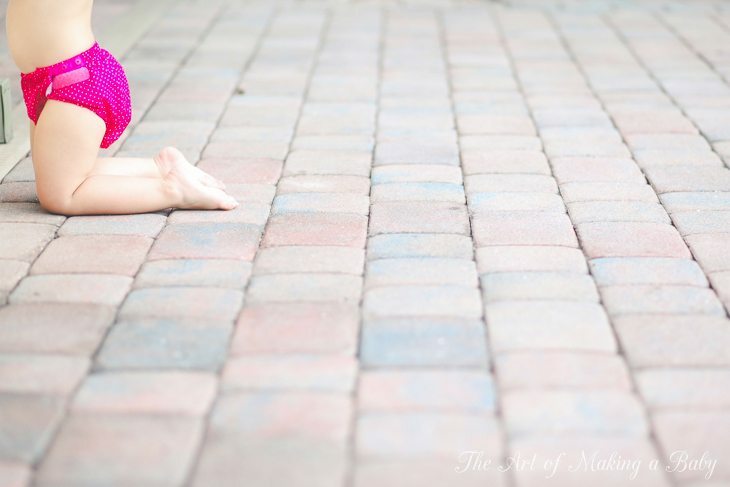 It’s hard to restrain a toddler as it is, but trying restrain Lexi who has hated being restrained since she was just few days old refusing any sort of container for longer than a few minutes…. She was perfectly fine in the office and walking around the exam room, sitting in the dentist chair. She has this e-book on the iPhone that she’s always loved, called Little Critter: Going to the Dentist, so she was somewhat familiar with the concept. Once the dentist examined her teeth from the front (which was no problem), she had me put her head in her lap while sitting in my lap facing me, so that she could use her mirror to look at her teeth thoroughly. 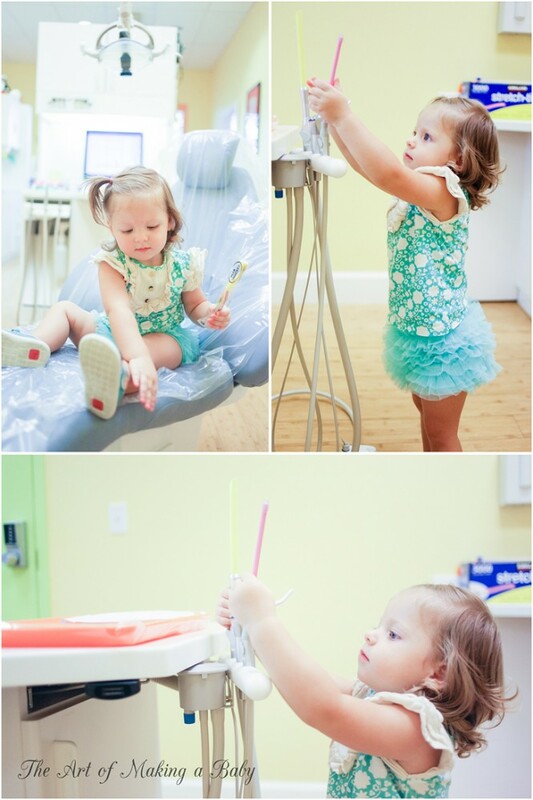 At first, Alexis didn’t even cry – the dentist was counting her teeth out loud and that was interesting enough to her. It was starting to take a bit too long and Lexi wanted to get up, at which point we had to keep her down, which, of course, upset her. Tears were very short lived, as she was done within a few seconds. So, to our surprise, this was a very “painless” experience and we use the tooth counting technique to brush her teeth now, as she resists it so much, so that is the only thing that actually keeps her attention once in a while at this point. At the ABC expo I discovered another brand that I loved represented by one of my favorite people I work with. Konfidence Swim is a UK based company that makes float suits, rashguards, warm suits for swimming, swim changing mats. 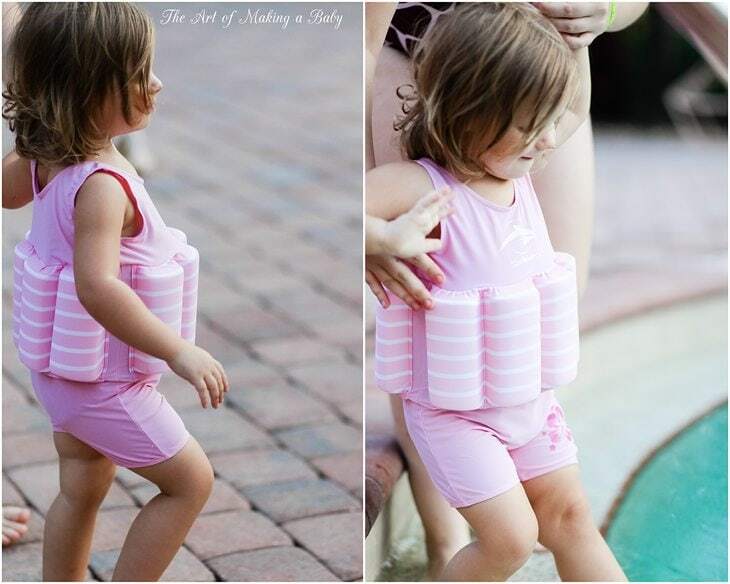 I’ve been using flotation devices with Lexi but none that she was completely happy with. 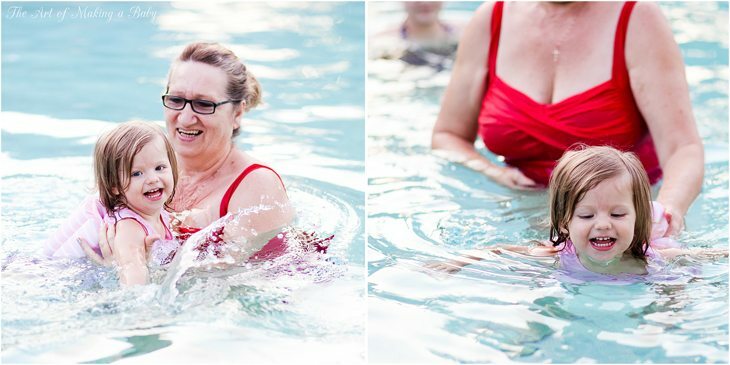 I got sent home with a float suit and a swim diaper which we have been using since and I have to say that it’s definitely the best option for those looking for some swimming help while letting their babies be independent. This is the first suit/float that Lexi does not complain about wearing since it has a very low profile. The swim diaper is superior to others, too. Very adjustable with both velcores and snaps, which means you can allow for a custom fit from 3 months to 3 years. So I know where I’ll be getting her floatsuits and swim diapers from now on. 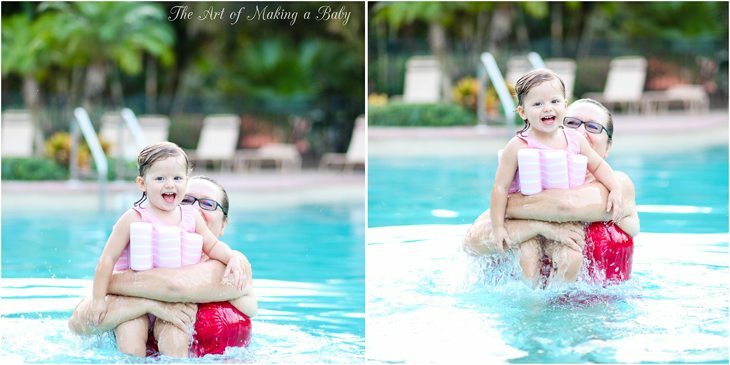 Anyways, this is what all of our pool days look like – that grin on her face! And you should have seen what she looked like when she first realized that she could swim on her own without a floaty. 🙂 The swimsuit keeps her above the water as long as she works her arms and legs. 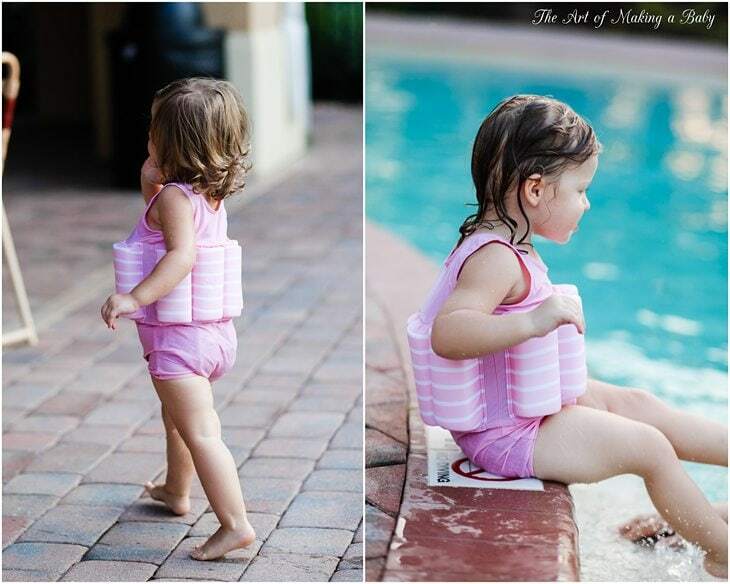 As she gets more confident, we will remove some of the floaties to allow her more freedom to balance herself in the water and stay afloat. 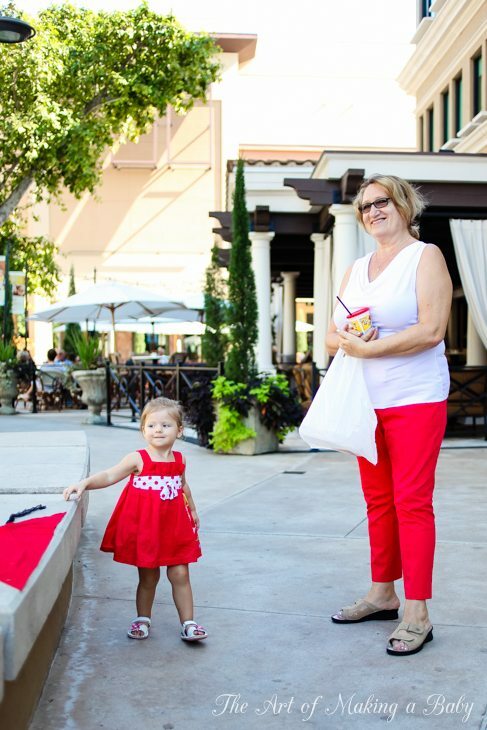 love your blog, and Lexi’s outfits! Is it possible for you to note what everyone is wearing at the end of your posts??? You generally save me the research this way 😉 Thank you! Yes sorry I usually do for this very reason but totally spaced out on this post. 🙂 will fix. She is such a beautiful little girl! She’s going to be a stunner like her mom! My goodness you and your mom look alike! 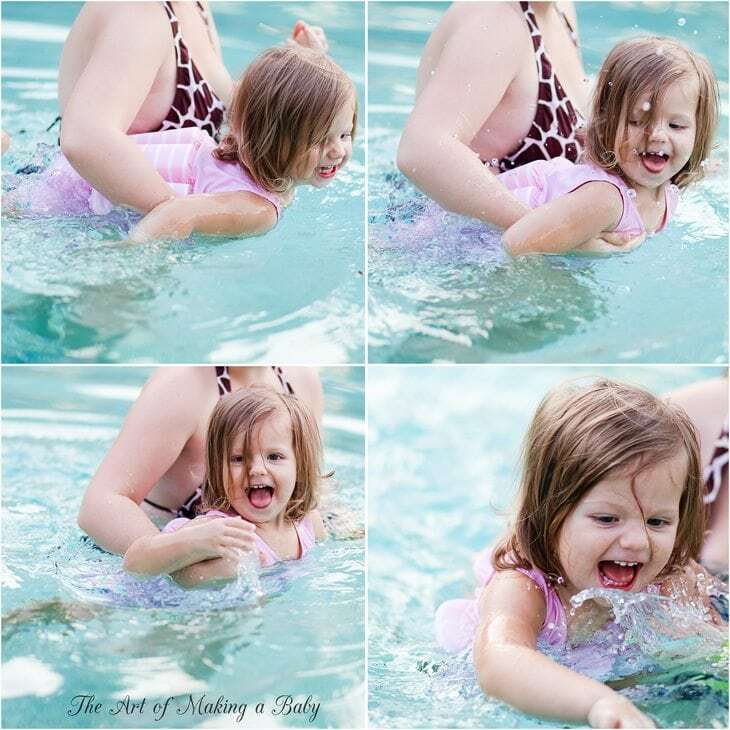 And Lexi, what a little water baby. She looks sooo happy in those pics. I wouldn’t expect anything else from a dentist though. Hahaha. Basically in the end she gave me these teeth wipes, though trying to wipe her teeth after she’s fallen asleep is a death sentence. Yes, lol, I get the same, “you have to realize she isn’t a baby anymore” comments. Even from my mom. Did the dentist notice the milk doing anything to the teeth yet, or was she just being proactive? Do you know when you will stop night nursing Lexi. Sorry if that’s too personal of a question. I have no plans to stop right now, as its a great comfort to my little one, but I do wonder if there are any lasting effects on the teeth. No, she was just saying it, because she is a dentist, she kind of has to. I have no plans on weaning her, I will let her do it herself. At least for now. But I honestly can’t even imagine how to do it, because it’s such a place for comfort for her. I am with you on that one, it’s such a comfort to her that I can not even imagine how to do it and am planning on letting her wean herself until I figure it out, I want to have another one soon though so we will see! 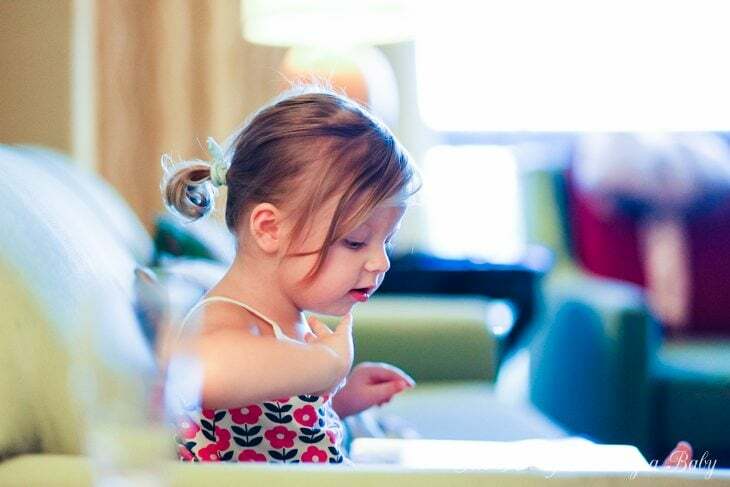 Hi Elena, lexi is growing so beautifully. What toothpaste do you use for Lexi? Thanks. I’m curious about your stance on flouride though, it appears you think it’s good. I’ve been seeing lots of studies pointing out that it’s really detrimental to health, and even to teeth (yes, opposite of what one would think!). I think I recently saw a Stanford study or something say it’s bad too. idk, but we’ve been using Earthpaste and we love it. Our 5 YO has beautifully healthy teeth, without flouride, so who knows. I know there are dietary factors etc involved too in regards to having healthy teeth, but I’d just love to hear your thoughts on it! Yes I’ve seen those studies too. That’s one of the reasons why we installed an RO system. Without doing too much research I decided that we would try and limit fluoride accumulation in her body through water but use a bit of topical fluoride to somewhat make up for it. At this point while she doesn’t know how to properly spit we just do a touch of toothpaste so she’s getting a minimal amount. I do think fluoride is important. The problem is we have been pumped too much fluoride through water. 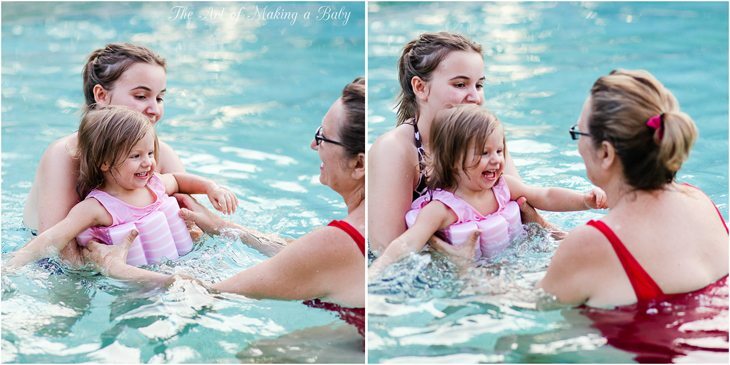 Lexi looks so happy with grandma and in the pool! I am envious of the beautiful FL weather, it is definitely past the pool time in NorCal. I’ve gotta say I’m shocked it took so long to get a dentist to see her. My family dentist has been so proactive, saw my son when he had his first teeth come through & every 6 months since. In fact, we did the counting thing with our son too because we learned it from the dentist. My girlfriend taught me ‘mouth house’. You divide the mouth into sections & clean it. So I’d do upper left & say “let’s clean the kitchen! Oh it’s so messy from dinner” then move to a new ‘room’ and clean it up. The tongue was the driveway & putting the teeth together was the windows. Now he loves to play dentist. He sits on the toilet & puts on his imaginary bib & I make the sound of the chair lowering. Graduating from my lap to the chair was a big deal for him, they did his first polishing at about 2 1/2. It makes me happy that he has a good experience, because I grew up with positive memories of the dentist. I was never frightened to go. I hope Lexi learns to like her dentist too. 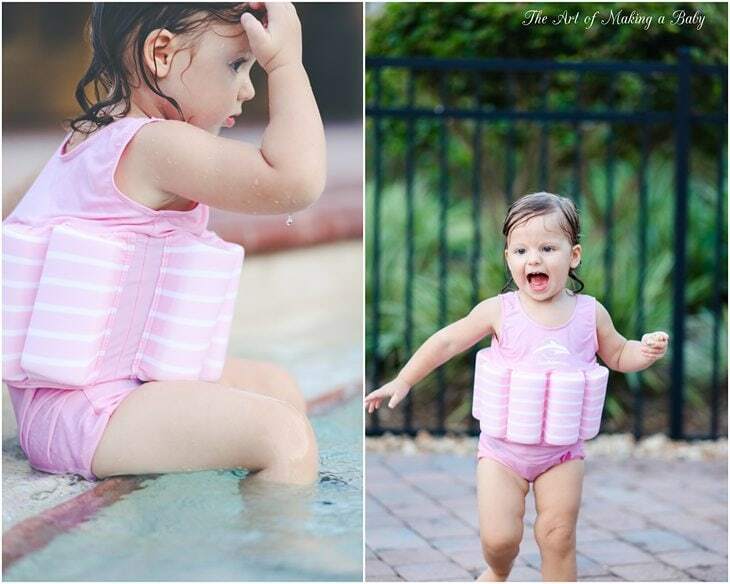 Really liked the idea of the floating swim suit for kids. Have not seen a model like that one before; but it is great.